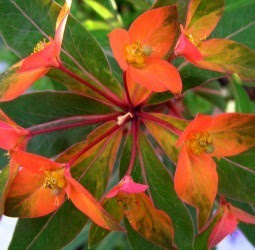 When walking in the countryside at this time of the year, the plants that stand out most are the Euphorbia's. The three photos above are the most common Euphorbias in the area. From top to bottom: Euphorbia characias, Euphorbia cyparissias and Euphorbia serrata. 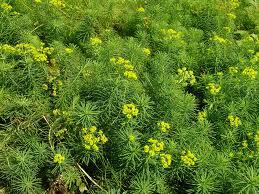 The name Euphorbia is named after "Euphorbus", a Greek physician to King Juba II of Numidia (50-52 BB-23AD). He wrote about a cactus like plant that was a powerful laxative. 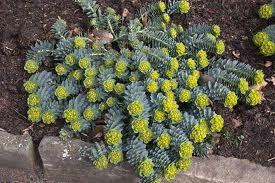 King Juba (married to the daughter of Anthony and Cleopatra) subsequently named this plant after his physician. When "Carl Linnaeus" created his system of plant classification, he assigned the name Euphorbia to the entire genus in the physician's honour. 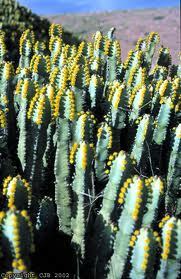 The Euphorbias are unique in the plant kingdom. 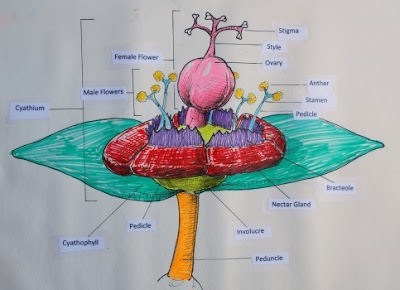 What we think is a flower is called a Cyathium. The Cyathium includes the male and female flowers with their specific parts, the nectar glands and the Bracts (Bracteole if they are small). 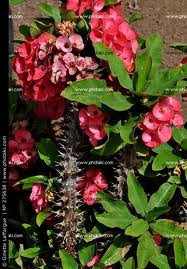 Euphorbia is one of the most diverse genera in the plant kingdom. 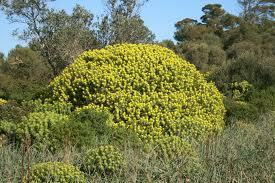 They belong to the Euphorbiaceae family which includes 2008 species. The Genus Euphorbia is found in tropical and subtropical regions of Africa and the Americas, but also in the temperate zones worldwide. 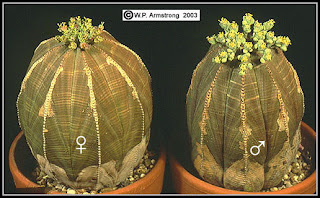 The plants vary, in most cases the female and male parts are on the same plant, but this is not always the case as for example in Euphorbia obesa. Some resemble more a Cactus as in Euphorbia resinifera, it is only when the this Euphorbia is in flower that we can recognise it as a Euphorbia. 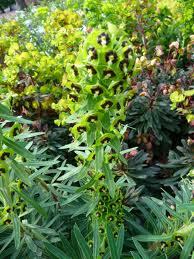 Euphorbia resinifera was used in poultices and creams to create a longlasting prickling sensation to the skin. Nowadays considered too dangerous to use. 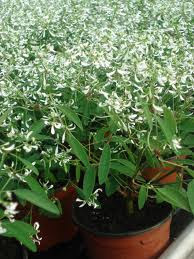 Euphorbia "Diamond Frost" is a relatively new cultivar. A wonderful annual that gives you pleasure from May to the frost. 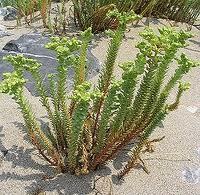 The common name for Euphorbia is "Spurge". 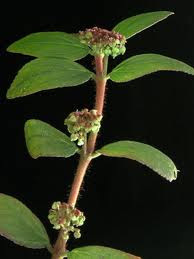 This name derives from the Middle English/Old French word "Espurge" (to purge) due to the use of the plant's sap as a purgative. Most spurges contain carcinogenic, highly irritant, diterpene esters and are strong purgatives. 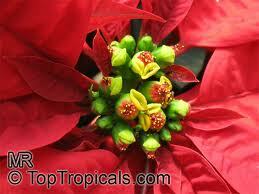 All Euphorbias are toxic if eaten. The sap (latex) is a serious skin and eye iritant. The only Euphorbia still used in herbal medicine is Euphorbia hirta, it is ester free and regarded worldwide as a safe, effective herb. 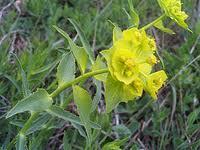 Internally it is used for asthma, bronchitis, emphysema, nervous cough, catarrh, hay fever, and amoebic dysentry. Externally for burns and warts. Bibliography: RHS: Encyclopedia of Herbs; Wikipedia: Euphorbia; Fytotherapeutisch compendium: J. van Hellemont; RHS: A-Z Encyclopedia of Garden Plants; The Pharmaceutical Press: Herbal Medicines. Got Weeds ? Use Vinegar, Not Roundup ! You all know that I am all for leaving wildflowers – they are necessary for a good eco-system in our gardens and are vital for bees and beneficial insects. I do concede, however, that there are times and areas where they are not welcome ! NEED PROOF THAT VINEGAR IS A WEED-TERMINATOR ? I’d say those weeds are deader than dead. 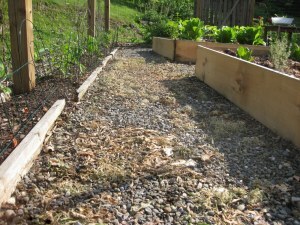 And that’s why I use vinegar on the gravel paths, brick walk-ways, and blue-stone patio here at A Garden for the House. For me it has proven an effective, eco-friendly answer to Roundup. And speaking of Roundup, this year Monsanto, the product’s evil manufacturer, agreed with the New York Attorney General’s office to discontinue their use of the terms “biodegradable” and “environmentally friendly” in ads promoting Roundup. Why ? Because these terms were bald-faced lies. Roundup is neither biodegradable nor environmentally friendly. The next time you want to murder your weeds, why douse them with something that will remain in the soil for who knows how long ? Maybe you should reach for vinegar instead. Vinegar is cheap. It’s easy to use. I keep gallons of it in my garden shed. 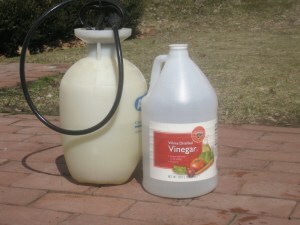 How to Apply : You can use a watering can, a spray bottle or a pump-sprayer to apply vinegar. I use a pump-sprayer, because it is more efficient. Be sure to rinse your sprayer after use, or metal parts (if any) can corrode. 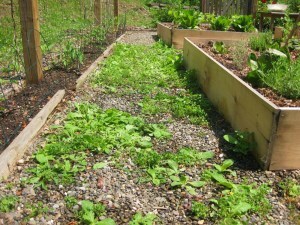 Will vinegar kill every weed in every garden ? That I can not say. I only know that it has kept my pathways free of unwanted growth. Take your time, don't be in a hurry – when you’ve bought a property, the best thing is to take your time. With an existing garden, before you start changes things it may be a good idea to see what plants come up during the first year. After the first year you'll have had time to reflect on what you would like to keep and what needs to be changed. The garden of a new property is a blank canvas, perhaps there are trees which can be used as focal points but, as with the existing garden, do not rush into things. Take into account the size of the garden in relation to the house. Make a list of what you would like to have in your garden i.e. practical and structural issues, and at the very last, what plants you would like. When a garden is well designed, you may not necessarily notice it, but if it's not well designed you definitely notice - it jars. Planning stage - The most expensive part of the garden is the hard landscaping. If you make a mistake it is very costly to change. Automatic watering system, pipe work and electricity cables for lighting, automatic gates, pool equipment, etc. all have to be thought of during the preliminary stages. The terrain in the Var is very rocky and stony and consequently in most cases the soil is, at best, poor and, at worst, negligible. Be prepared to buy in earth from a good source. If the house has a view of any description, avoid planting trees around it. Trees should not be planted near the house or pool as because the roots will cause problems to any terraces that may be laid, and even to the foundations of the house. The general rule is that the tree should be planted 1 & 1/2 times it's final height away from the house. 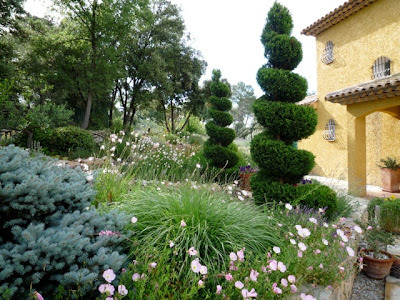 Pencil cypresses are architectural and can be used to frame a doorway, gates, arch, feature etc. If you have a steep bank, create terraces with the highest plants at the back and shortest in front so that one does not obscure the other. Composition - basically a garden is made up of hard and soft landscaping with voids (all low laying features like, swimming pools, lawns, terraces) and masses (plants, pergolas, furniture ). The ratio should be 1/3rd mass to 2/3rd void. Pool – avoid planting trees or shrubs which drop leaves close to the pool. Seating areas - make a note where the shade is at various times of the day in the areas you are thinking of putting table and chairs (this will change in summer when the sun is higher). Terraces - ensure that terraces are deep enough to allow guests to pull back their chair to sit down at the dining table and to move behind chairs when people are seated; and that they offer adequate shade from the summer sun. Make sure surfaces are non-slip near the pool and when it is raining. Paths - should be wide enough for two persons to walk next to each other. 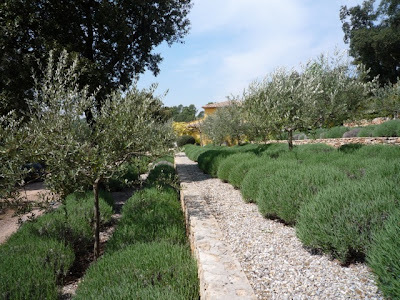 If you have a straight path make sure it has a focal point (statue, large olive jar planted with citrus tree or olive, an exit to a field or view beyond) so that the eye is connected to the focal point otherwise it will be a dead end! Steps - if you are to put steps leading to a terrace for example make sure the steps are in proportion and not just something stuck on the side as an afterthought. Planting - choose plants/trees that are drought resistant (after the initial first season watering) and frost tolerant to -12C and be aware that coastal garden centres may not stock frost hardy plants. 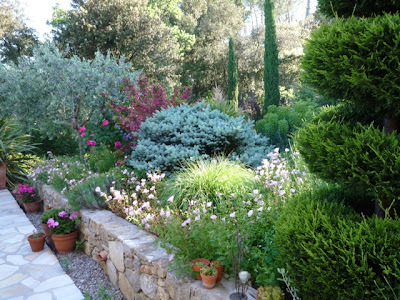 Repeat planting with a repetition of plants, shapes and forms is more effective than a garden full of different plants. Keep uniform shapes and sizes next to each other to avoid the "little and large effect" ! Different leaf textures and greens are just as interesting as flowering plant. 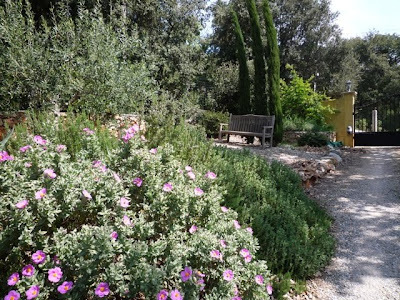 Terraces of lavender against stone walls, for example, are evocative of Provence but lavender may need replacing every 5 years when it can become too leggy and woody Plant in three’s or odd numbers. Plant in two’s only as a focal point, e.g. either side of a door. When choosing colours, purple and blues planted at the end of a garden make the garden look longer, red and orange colours shorten a perspective. 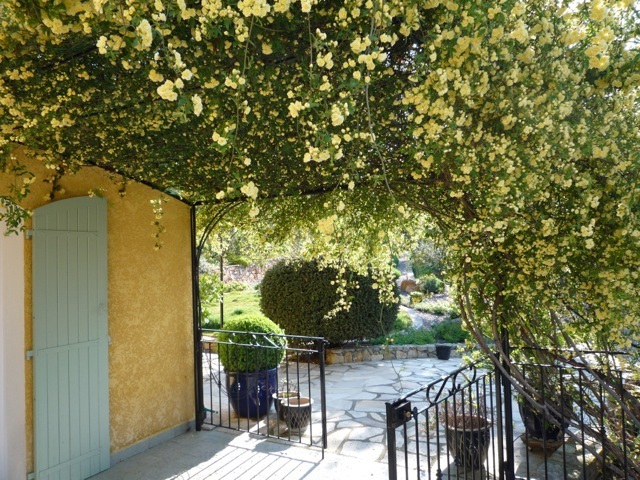 All pale or subtle colours appear white at a distance so choose strong colours for plants viewed from far away. In the colour spectrum, any colour that lies next to the colour green (such as blue and yellow) is in harmony. For instance, the colour red on the colour spectrum comes after yellow and orange and is further away from the colour green so when planted together, it creates a contrast. Colours that are next to each other on the spectrum go well together.